WILMORE, Ky. — Asbury University became the first private institution of higher learning in Kentucky to enter the Kentucky Proud Farm to Campus Program in a ceremony today in front of the school’s Johnson Cafeteria. 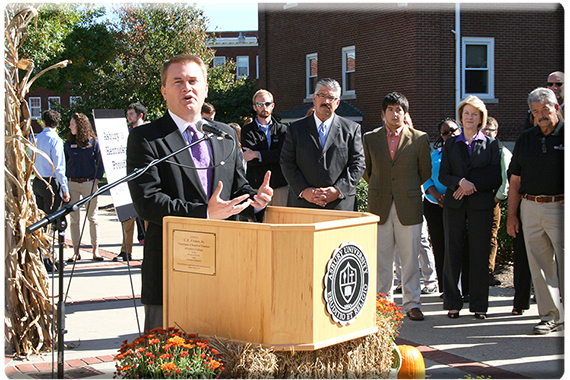 Commissioner Comer said Asbury’s entry into the Farm to Campus Program helps the local economy by keeping more food dollars in the community while enabling Asbury to serve more healthy local foods to its students, faculty, and staff. Asbury joins Eastern Kentucky University, the University of Louisville, and Morehead State University as members of the Farm to Campus Program. More announcements are planned later this year at other Kentucky colleges and universities. Under the Farm to Campus program, the Kentucky Department of Agriculture partners with Kentucky colleges and universities to help with their buy-local efforts. Over the next two years, the department will target college campuses to put more shelf-stable Kentucky Proud products in their bookstores and gift shops, and more farm-fresh Kentucky Proud products in their cafeterias and food service systems.